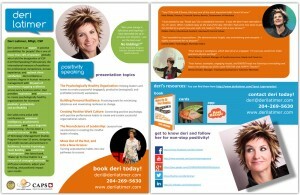 Deri Latimer is positivity speaking! She is one of fewer than 15% of speakers globally who hold the designation of CSP (Certified Speaking Professional), combining a Business degree in Human Resources Management with 20 years of experience providing high-value speaking and training services to virtually every industry and business sector. Deri is qualified to use the BarOn EQ-i (Emotional Intelligence Indicator), and the Myers-Briggs Type Indicator (Personality Profiling), in addition to being a practitioner of Neuro-linguistic Programming (NLP). She adds extra value through her experience with Appreciative Inquiry (AI), and Mindfulness-Based Stress Reduction (MBSR). Deri has been a popular instructor in the University of Winnipeg’s Management Studies Program for over 15 years, designing full-credit courses and seminars in Positive Psychology, Resilience, Human Resource Management, and Leadership Development. Her latest book, Wake Up To Your Habits is a rich resource of strategies and tools to shift your emotions, adjust your thinking, and positively impact your results. By the time I was 27, I lost two important men in my life; my father at age 45, and my husband of 8 months at age 27. My father died from extreme stress. My new husband died by suicide. After my father’s death, I discovered the tremendous stress he was under while going through his personal notes. I knew then that I had to build my career around helping others avoid this tragedy. I also saw my mother struggle to find her new reality without dad, and I wanted to learn what I could to help myself and others become resilient, resourceful, and happy, no matter what life brought. I achieved a Bachelor of Management Degree from The University of Lethbridge, and majored in Human Resource Management. I worked in telecommunications and enjoyed learning about the human side of business. Shortly after graduating from university, I met a wonderful man. After two years of dating, we decided to get married. Within 8 months (while I was still on the honeymoon) he died by suicide. I was completely blind-sided. I was in a state of shock. In the months that followed, I moved back to Manitoba and started to re-build my life. I was able to land a great job with Northern Telecom Canada Ltd. in Winnipeg. In my first week, my new manager took me to lunch. At lunch, when he referenced that he knew I was a widow (he did not know the circumstances of Kelly’s death, I was not sharing those as I had not yet come to terms with them myself), my new boss then said three words that changed my perspective. I envy you. He went on to explain. I envy you, Deri, because at this very young age, you get to decide what kind of life you want to live. Lots of us don’t think about that until we are much older, and some people never do think about it, until they find themselves filled with regret on their death bed. You have been through a terrible experience, and you can turn it into an opportunity to craft your life as you want. My resolve to help others be psychologically well was strengthened even more. I devoured anything I could find, and I immediately started sharing what I learned with anyone who was interested. In 1991, I met two people I admired and I left my job at Northern Telecom to join them in their consulting practice. After two years, I ventured out on my own and have never looked back. I have spent my career (my life, really) inspiring and energizing people to engage in positive mental health practices for greater happiness, more success and a longer life. Just recently, someone I care about lost his marriage and, almost, his life. Something happened at work that he deemed a failure, and that caused a downward spiral into depression, addiction and despair. I have an amazing spouse, two joyful children (now young adults), tons of family, friends and professional clients that I value highly. I want to turn the negativity associated with the term mental health into the positive, hopeful message that makes it attractive and achievable for everyone.